The following is a guest post by Nick Williams of IHateBarreChords.com. If you are interested in guest posting, please contact me! These pedals are often – though not always – pretty expensive. Their prices can rival that of the guitars themselves and this can make them seem somewhat inaccessible – at least in the short term. Being in such a situation personally, I was determined to find a way to experiment with all the possible effects while I saved up to buy a proper pedal and did quite a lot of digging to find a way to do so – though it wasn’t nearly as hard as I expected. 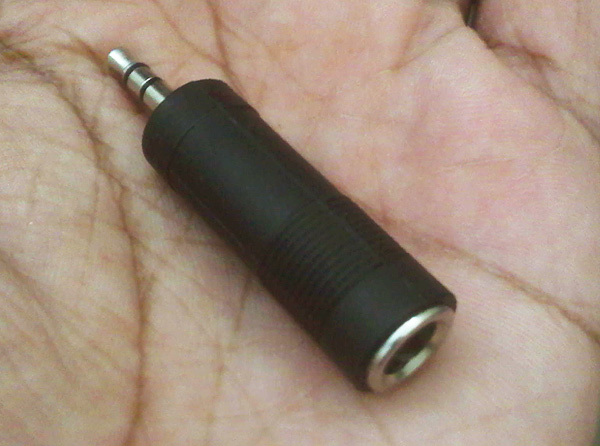 The first thing I needed (and that you need if you want to use a computer to mess around with effects) is a 1/4 inch to 3.5 mm jack – aka a little connector that lets you put the end of your guitar cable into one end and plug the 3.5 mm extension on the other side into the mic jack of your computer. In short, you’re routing your guitar signal directly into your laptop instead of running it through an amplifier*. Next you’ll need a software application called Gnuitar. I’m a Linux user so I went looking for a cross-platform solution that works on both Windows and Linux (and I think Mac as well). It’s free and it requires no setting up whatsoever (other than selecting your effects). 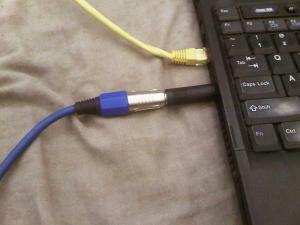 You just need to connect your guitar to your laptop (or any computer) as explained above and run the application. You’ll see a start button that will trigger the program to start outputting the incoming guitar signal through the speakers. Finally, you’ll notice a very diverse set of effects to choose from : (i) two different distortion settings (ii) tremolo (iii) whammy (iv) wah-wah (v) reverb (vi) chorus and so on – plus some filters to help weed out any unwanted noise. That’s it! Your computer now works as a distortion/effects pedal and all you need is a little 1/4 inch to 3.5 mm adapter that costs about one dollar and maybe an extra cable (see below). You can now mess around with all the cool effects you’ll be able to rock out to with an actual pedal (and hopefully be more motivated to save up and invest in one). I should point out that the software effects sound great but they don’t compare to an effects pedal dedicated to the purpose and it does sound pretty artificial when compared side-by-side with an authentic piece of quality gear. Still, it’s great for experimenting with different sounds and practicing when an actual pedal isn’t handy. Mod.It.Yourself (M.I.Y) Part 3 – Switches Amazon 25% Off Soldering Equipment Guest Post – Lucas Hoelbling – MOM-D What Makes a Guitar Sound Amazing?